Update May 4, 2017: Almost one year after its decision to regain $183 million in milk price ‘overpayments’ from farmers, Australia’s biggest dairy group Murray Goulburn is backflipping on its decision. According to a 2012 milk supply contract (the Bonlac supply-agency agreement), rival company Fonterra is legally obliged to match or better the farm milk price paid by price setter Murray Goulburn. This means, legally, Fonterra will most likely have to pay an extra 3.5 c per litre for the 1.7-billion litres of milk supplied by farmers from 2015–16 – that’s around $60 million, and an average of $45,000 per farmer. The repayment would be a significant improvement after a year of anguish for Australian dairy farmers. Fonterra Australia has called an urgent meeting with its milk farmers today to address the decision – we’ll keep you posted on more news as it comes. We know we don’t need a reason to eat more cheese. But Australian dairy farmers are currently being faced with deep financial crisis due to a slash in farmgate milk prices from Australia’s two biggest dairy companies, and eating more cheese is a simple (and delicious) way we can lend a hand. If you’re a little confused about what dairy brands to buy to help local farmers, we can help you out. This Wednesday, June 1 2016, is the 16th annual World Milk Day. The Food and Agriculture Organisation of the United Nations recognises this day as an opportunity for the greater community to focus its attention on milk, its products, and the milk industry. This year, perhaps more than ever, Australians should be taking the time to consider their dairy consumption and consumer choices to help support our local farmers during this difficult time. So how can you help? Pay a few extra cents for your dairy products. Steer clear of home brand and supermarket unbranded products and buy Australian-produced brand-name dairy. 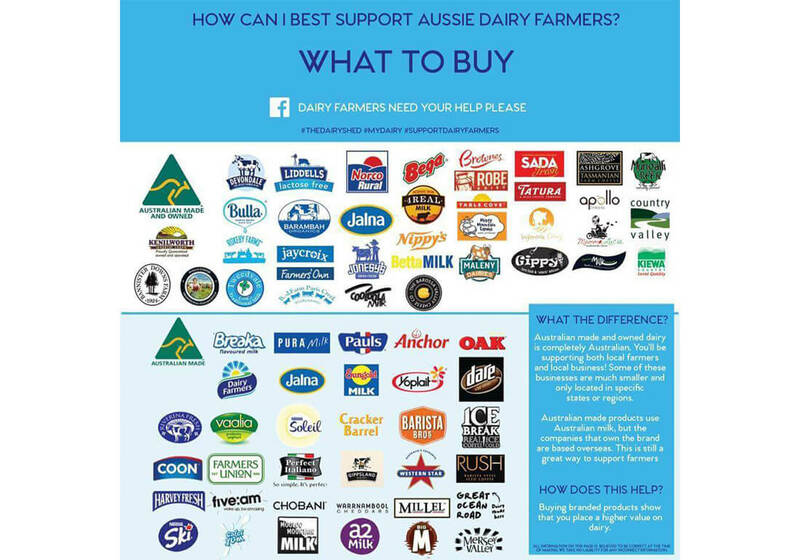 Although companies such as Fonterra and Murray Goulburn have administered the milk price cuts, and many dairy companies are based offshore, they still use Australian milk and hence, by buying these products, you are still supporting Australian farmers. What else can you do? In the words of Waleed Aly, eat more locally produced cheese! That’s right – by eating Australian cheese you are helping save our farmers. If that’s not a reason for a cheese binge, we don’t know what is. If you’re still not sure, the handy infographic below should be able to help you out. This of course only names a selection of brands – there are a lot of other local producers out there that need your support too. Head to your local farmers markets or look out for cheese and dairy from producers such as Derry-O, Witches Chase Cheese Company and White Gold Creamery to name a few. You can also get your local dairy delivered to you straight from the producers with Aussie Farmers Direct – the site is even allocating all of its May donations to support dairy farming communities. What are you waiting for? Go eat some Aussie cheese!